Investor anxiety isn't cooling off in November. Following October's status as the worst single month for stocks since 2011, November's rebound rally is being interrupted by what's shaping up to be five straight days of selling for the big S&P 500 index. But there's a silver lining to those black clouds. While markets correct in November, a select segment of stocks is actually setting a foundation for a year-end rally thanks to a pretty textbook bullish reversal setup. One of those stocks is Sirius XM Holdings Inc. (SIRI - Get Report) . 2018 has been a trying year for shareholders in Sirius XM. After peaking back in June, this stock has undergone extremely choppy trading, ultimately being dragged lower alongside the rest of the broad market in October. Worse, relative strength has been in a downtrend over that period, signaling that Sirius XM hasn't just moved lower in a pressured market - it's also underperformed the S&P over that stretch. But buyers could finally be taking back control of this entertainment stock. That's because Sirius XM has spent the last month and change forming a pretty textbook example of an inverse head and shoulders pattern, a bullish reversal setup that signals exhaustion among sellers. The inverse head-and-shoulders setup is formed by a pair of swing lows (the shoulders) separated by a deeper low (the head). 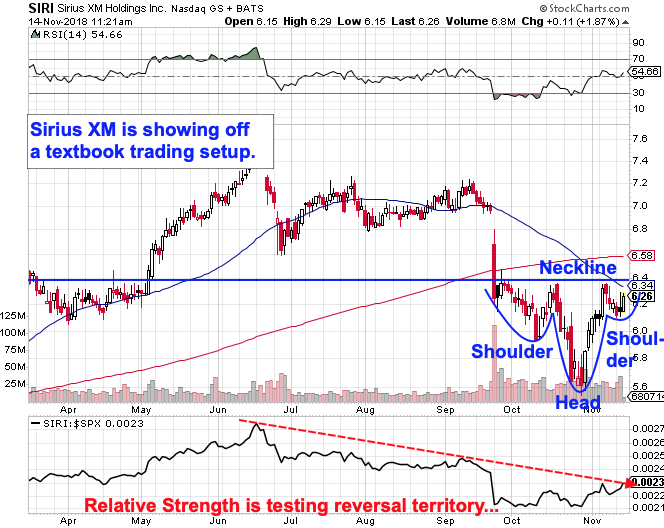 For Sirius XM, the buy signal comes on a breakout through this setup's neckline at the $6.40 level. Shares are within grabbing distance of that $6.40 line in the sand this week. Don't let the hokey "head and shoulders" name fool you - an academic study conducted by the Federal Reserve Board of New York found that 10,000 computer-simulated head-and-shoulders trades resulted in "profits [that] would have been both statistically and economically significant." Meanwhile, Sirius XM's relative strength downtrend actually adds some confirmation to the reversal potential here. A breakout above $6.40 would break relative strength above its downtrend, kicking off a potential switch from Sirius XM trading as a laggard to taking a market leadership role. Remember to be reactionary with Sirius XM; technical analysis is a risk-management tool, not a crystal ball - and Sirius XM doesn't become a high-probability buy until shares can materially crack the $6.40 price level.